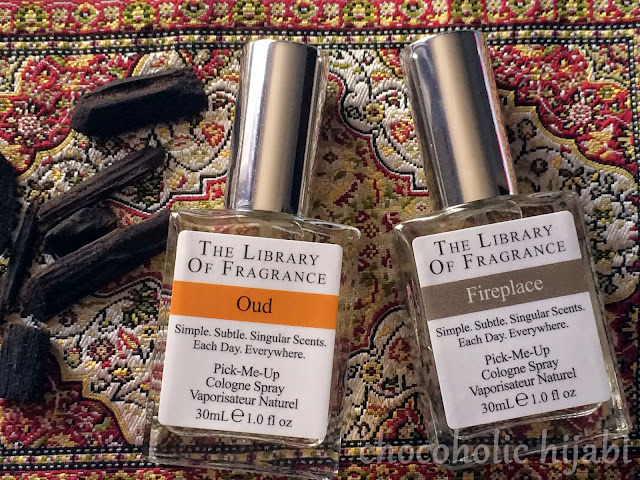 Library of Fragrance launched in the UK late last year, with 101 scents available here in the UK via their website and a selection also available at Boots. I had the opportunity to try out two from the range and decided on Oud and Fireplace. As much as I love that Summer is coming, these scents remind me of Autumn and Winter. Not of a specific moment but just that general feeling of cosiness, with the candles lit and listening to the rain fall on the rooftop. The method of using wood for heating homes and offices is almost as old as time. It was during the Victorian era, however, when fireplaces started gaining popularity. During that time, people felt that in addition to the production of heat, fireplaces added a touch of class, creating a cosy, homely atmosphere. The Library of Fragrance has captured a small part of this tradition, with the wonderful, comforting scent of the fireplace on a cold winter’s evening. It smells exactly like your jumper after sitting for hours in front of a roaring wood-burning fire. Oud is also called agarwood. It comes from the wood of the tropical agar (aquilaria) tree, believed to have originated in the Assam region of India, and spread from there throughout Southeast Asia. When the wood of this tree gets infected with a certain mould variety (phialophora parasitica), it reacts by producing a precious, dark and fragrant resin from which this precious perfume ingredient is derived. Oud is highly valued by perfumers for its sweet, woody, aromatic and complex scent. It is a classical note in perfumery, most often used as a base note. Our Oud fragrance refines and isolates the oud note into a wearable, single note scent, whilst maintaining its full, rounded and enveloping nature: beautiful worn alone, or layered with other scents to add rich, mysterious depth. Both are fairly strong fragrances, and while I appreciate wearing them individually, I think they're best when layered. The combination of musky Oud and smoky fire logs, is definitely my personal favourite, and the two scents create a sweet yet rich blend, perfect for evenings out. It also has a slight masculine tone, which completely goes against my normal girly-vanilla based perfumes, but it's something that I can't get enough of. There's no need to imagine creating your own personal fragrance, with Library of Fragrance you can choose individual scents and layer them to for a bespoke cologne. At £15 for 30ml, they give you the opportunity to create your own custom blend without breaking the bank. There are 28 fragrances available at Boots (currently on offer at 2 for £25) and 101 fragrances available online here. I know that I'll be popping over to Boots soon to pick up a few more scents, with my eyes on Baby Powder, Vanilla Ice Cream and Musk #7. Will you be layering up your fragrances for a unique scent? Note: This post contains PR samples however all views and opinions are entirely my own.